What are you planning to wear for Thanksgiving? This year (as any previous year) Balazs and I are celebrating Thanksgiving at our friend's place. So it's all about casual, comfy wear, but still looking like we tried to make an effort:) Anyway, last week my friend Amy convinced me to get a leather skirt, so my plan is to recreate this little comfy outfit above just in time for next Thursday. It looks to me like the perfect no-squeeze-uniform for a day when you are guaranteed to stuff yourself. 1. Oversized cardigan or this one, 2. Foxy bra that is truly addictive, 3. Bike ring, 4. MAC lipstick in chili, 5. Pleated leather skirt. 6. Polka dot top, 7. Kiehl's 'Musk' perfume (scent that you'll want to wear over and over again), 8. Soft circle scarf, 9. Black boots, 10. Duffle shoulder bag, 11. Black tights. P.P.S: Christmas dinner at the in-laws. YES. I have a long sweater that looks almost identical but I need to get a skirt. Do you think I could wear it with a deep red velvet skirt instead? GREAT outfit, love the warm colors and cozy vibe. 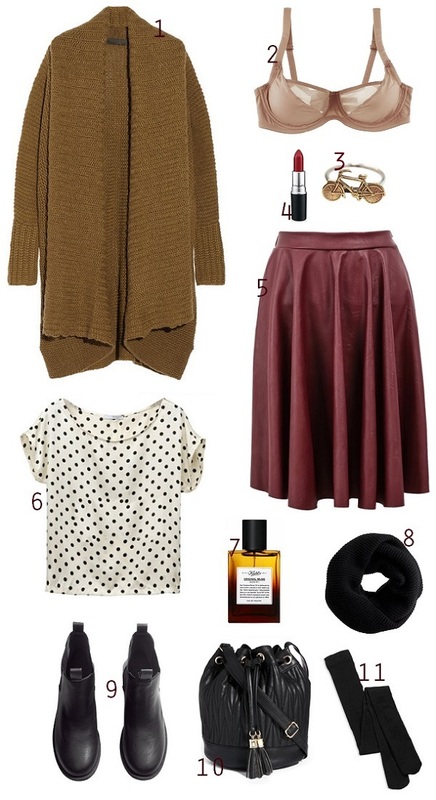 Such a beautiful look - I love the wine colored leather skirt!